Figure 1. Laird Hamilton working on his brachistochrone problem. The solution to the problem was solved by five of the great natural philosophers of the day: Bernoulli (Jakob – the brother of Johann), Leibniz, de L’hopital, von Tschirnhaus and Newton who was working at the Royal Mint at the time. Despite being less than pleased by the timing of the challenge (“I do not love to be dunned [pestered] and teased by foreigners about mathematical things …”) Newton stayed up until four in the morning to write down his solution. The mere mortals amongst us will initially assume that a straight path is the answer, as it is the shortest distance. However, we’re looking for a path which will always give the shortest time. It’s easy to show that this isn’t the case, as follows. Consider the top picture in Fig. 2 and the ball rolling down the slope from O to C. If the slope was shallow, then the ball would roll really slowly. However, the ball could be made to drop vertically from O to A to gain speed (Galileo showed that the velocity was proportional to the square root of the depth); it would then travel at constant velocity from A to B and then from B up to C (of course this relies on everything being frictionless). ﻿﻿In the extreme when the slope from O to C is horizontal, the ball would not move. Therefore, the straight line is not always the shortest time. Fig. 2. 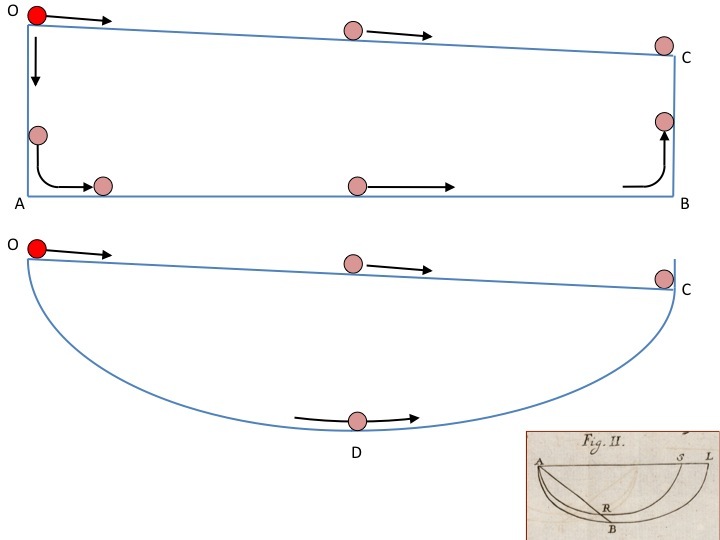 A ball dropping down below a straight slope can arrive quicker even though it travels further (a sketch of the brachistochrone by Johann Bernoulli in 1697 is shown bottom right). Of course, a ball would struggle to turn the corner at A or B so smoothing off the corners would be better. Video 1 shows Tony Hawk putting this into practice on a vert ramp. The optimum path is comparable to the lower diagram in Figure 2 (Bernoulli’s sketch is shown bottom right). Video 1. Tony Hawk hasn’t quite reached the optimum solution. The solution is, therefore, a compromise between travelling further and travelling faster due to gravitational acceleration. While Galileo had thought the optimum shape was the arc of a circle, the later masters showed that it was actually a shape called an ‘inverted cycloid‘. Video 3. clearly shows the advantage of the inverted cycloid. Video. 2. Video proof that the curve is faster than a straight line (acknowledgment to KoonPhysics). So, now we’ve got the physics of it out-of-the-way, what about sporting applications? Well, I first came across the brachistochrone in the a book on sports aerodynamics edited by Helge Norstrud. In the context of winter sports, it’s pretty obvious that the key objective of events such as downhill skiing, bobsled, skeleton and luge, is to minimise the time of travel between the top and the bottom. For designers of such courses, therefore, the brachistochrone is the most appropriate slope to create if world records are to be broken. I’ve also seen it commented that the shape that skiers follow between posts during a downhill event is also a brachistochrone (although I haven’t found a formalized proof of this). I have to admit now that I’ve shamelessly stolen the title of this blog from Bruce Henry and Simon Watt at the University of New South Wales (where else?!) who wrote a short paper on the physics of surfing. It appears from their analysis that many surfing manoeuvres follow the line of the brachistochrone curve whether it is executing a turn down a wave to carve back up and rejoin the peel of a spilling wave or getting up to speed as quickly as possible to ride the barrel of a plunging wave. In fact ,surfing is about having fun and maybe the surfers are simply taking the path which gives them the greatest sense of acceleration. I’m sure there are other applications in sport which involves gravity and the minimization of performance time – cheese rolling perhaps – and I’d love to hear of other examples. The ramp designers at the Red Bull Snowscrapers would have done well to consider the brachistochrone. In the meantime, the video below shows how Laird Hamilton – the greatest big wave surfer of all time – proves right Newton, Bernoulli and all the others who’ve considered the problem of the brachistochrone. Video 3. Laird Hamilton proving Bernoulli and Newton right. Very interesting article, nice work! Mike, thanks for the compliment. If you’re interested in maths and physics in sport there is a great website at the bottom of my latest article on ‘Using sport to teach science’ called Mathematics in Sport. this article interests me a lot in terms of the sport I compete it. I race in ski cross (check out some footage on youtube). Like you said, we don’t necessarily travel in the shortest route from point A to B on the course. Sometimes using the shape of the turn to generate speed is faster. Kind of like your example of the inverted cycloid curve but put on it’s side. Can you tell me what you think the fastest way to ski a berm (banked turn) is?